NXP Semiconductors (NXPI) has seen its gains chipped away since a weak report from Apple (AAPL). The good news is NXPI stock may now be more sweet than bitter in front this week’s earnings release — especially if bullish traders use option premiums to their advantage. NXPI is definitely dependent on Apple, and in particular the tech giant’s iPhone product, for which the company supplies components. That said, when Apple announced iPhone sales of “just” 47.5 million last week — a number that came in modestly short of forecasts of 49 million — NXPI stock saw some pressure as shares hit levels not seen in nearly five months. Jim Cramer recently huffed and puffed on paper that NXP — along with Cirrus Logic (CRUS), Skyworks Solutions (SWKS), Avago (AVGO) and Qorvo (QRVO) — are “just one big iPhone stock, they live and die by it.” But NXPI is also about the “IoT,” or Internet of Things. IoT holds the potential of being one of technology’s next, big, big things, and NXPI is very well-positioned to ride this trend. Activision Blizzard: ATVI Looks Strong, So Go Long! Additionally and if one’s focus is on how Apple’s prospects impact NXPI, one tech strategist and proclaimed Apple expert sees Apple’s recent guidance as typical conservative sandbagging based on fellow Apple supplier Cirrus Logic’s blowout numbers last week and a company much more highly-leveraged to Apple. Regarding NXPI’s upcoming report on Wednesday night, analysts expect NXP Semiconductors to announce profits of $1.24 per share compared to last year’s 94 cents. At the same time, the company is expected to produce a slight bump in sequential revenues to $1.6 billion from the prior quarter’s $1.5 billion and adding to its string of sales gains over the past 11 quarters. Over the past several quarters, NXPI has managed to either match or beat earnings forecast by a modest low single digit percentage. And for the most part, reaction in shares of NXPI immediately following the report have shown similar, mostly modest and far from dazzling gains in the stock. Specifically, the last six quarters and working backwards, has produced returns of 0.73%, -1.86%, 0.08%, 1.22%, 2.45% and 5.53% in NXPI on a close-to-close basis after releasing its results. Using absolute values, the average move during this period has been 1.97% and one standard deviation of wiggle room of 1.93%. 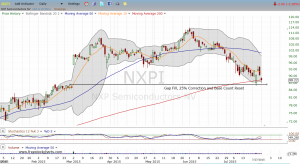 Click to Enlarge In reviewing the provided daily chart of NXPI there’s four key items that bode well another upside reaction from earnings — and in our opinion, possibly a larger-than-average reaction as well. Of particular interest, our attention is turned to the current correction in NXPI stock which has provided solid testing sufficient for a reversal higher. First, shares of NXPI have pulled back 25% from recent highs. That’s a nice-sized but also constructive correction in the world of growth stocks where moves of 20% to 30% are common without being destructive. As the corrective lows were struck this past week shares of NXPI also made their first test of the 200-day SMA in 2015. That’s a good sign, as is NXPI’s gap fill of a major upside gap back in March. Lastly and yet another support for a reversal higher, the move lower over the past several weeks has also enabled a reset of the weekly base count. This occurred after NXPI stock traded below $93.45 and the lows of the base building up to late May’s failed breakout. Click to Enlarge Looking at NXPI volatility and implieds in relation to the past couple earnings events (denoted by the blue triangles), premiums and stock volatility are currently matching those highs. While we see room for a modest volatility crush, we don’t anticipate a move back to the June lows slightly below 30% in either option premiums or the underlying stock. If we’re correct in our prior technical forecast of a low in shares of NXPI and a stronger-than-average reaction, an outright call purchase would certainly do the trick. However, if we’re only half right and willing to use the premium build to our advantage; a bull call spread is more approachable as an earnings play. In scanning the NXPI options board, the Aug $85/$92.50 for $3.60 is attractive. The cost is roughly 4% of the stock price and about 0.5% from breaking even on an expiration basis at $88.60. If shares of NXPI do indeed make a larger-than-average move, maximum gains of $3.90 above $92.50 require just 5% from the stock while returning nearly 110% on the call spread. And as the spread compares to an outright purchase of the $85 for $6.20 or the $92.50 for $2.60 and obviously much riskier propositions; chips placed on a vertical are a smart policy. Investment accounts under Christopher Tyler’s management do not currently own positions in any of the securities or their derivatives mentioned in this article. The information offered is based upon Christopher Tyler’s observations and strictly intended for educational purposes only; the use of which is the responsibility of the individual. Article printed from InvestorPlace Media, https://investorplace.com/2015/07/nxp-semiconductors-nxpi-earnings-preview/.